The term as used in Britain is trades union (plural: trades unions) because they were a joinng of men working in different trades. For example: on the engine of a steam locomotive were two men: a driver and a stoker shovelling the coal into the oven. The driver was a skilled man, and paid much more than the stoker. They were two different trades. When they joined into the Associated Society of Locomotive Engineers and Firemen (ASLEF), their negotiations with management was done together. A quite different union, the National Union of Railwaymen (NUR) looked after other employees of the railway compaies. That was a whole collection of different trades. Trades unions are the descendants of the trade guilds of mediaeval times. These guilds were made up of independent skilled workers (or artisans) who who had been apprenticed and qualified by a guild. 1. Preventative legislation (laws etc.) most notably the Combination Acts 1799–1800 2. The prevalence of the domestic system of working. 3. an identity of interest between employer and the domestic employee (domestic employees only had contact with their employer and not with their fellow employees – employers adopted a “paternalistic” approach to their workers) 4. Factory works was undeveloped in the early 19th century. As soon as factories had taken off the ‘working classes emerged. The traditional bond of trust between employer and employees were later eroded and working people began to club together. 5. Government fears. The government believed that all working people could club together and react en mass to social change scared the government. The ruling classes associated ‘combinations’ with revolution. The many Combination acts of 1700–1800 aimed to prevent trade unions from being formed. 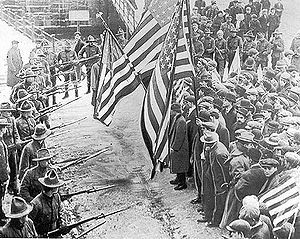 Why was the GNCTU Formed? The objectives of the GNCTU were straightforward and traditionalist, thus strike action was to be used: 1. To improve wages and/or conditions; 2. To protect workers from any erosion of wages and/or conditions. Unions have been criticized for increasing the cost of workers. Because of this, it is said that fewer people will be hired. ↑ Greenhouse, Steven (2002-12-12). "The Transit Showdown: Assessment". New York Times. ISSN 0362-4331 . http://query.nytimes.com/gst/fullpage.html?res=9C06E4D6123AF931A25751C1A9649C8B63. Retrieved 2008-06-19. This page was last changed on 15 December 2014, at 14:38.